Just a little update that fixed a few issues on some older mobile devices. Also the site is how HTTPS enabled. Update: 12th March 2017 Another big update here. [FIXED] - Some Charts would not load fully in their popup. [FIXED] - Pagination on certain screens would not always work. Update: 8th March 2017 Our first update for over a year :) Thanks to Haley who has joined the team for getting these changes/fixes in place. We'll also be working on some new features and making the dashboard work better on Tablets and Mobiles. For now here are some quick fixes/updates. Update: 28th December 2015 Some minor bug fixes and performance improvements. Update: 10th August 2015 A couple of updates. [NEW] - Articles that you have previously read are now colored differently so that you can easily spot the new articles. 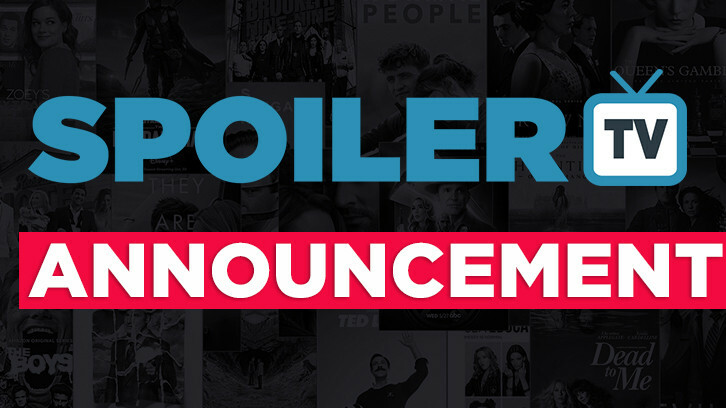 [NEW] - In addition to Season Premieres, Season Finales are now color coded on the Calendar so that you can easily pick out the Premiere and Finale Episodes. 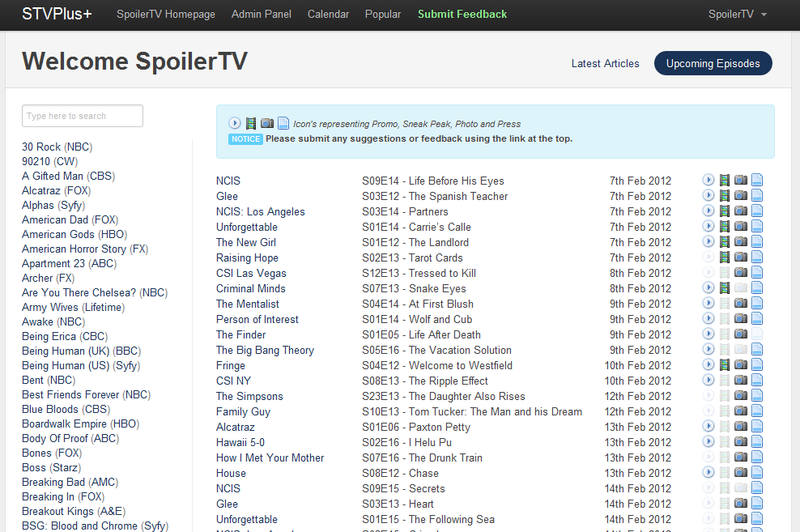 [FIXED] - Shows that don’t have ratings eg Netflix, Yahoo etc show now not display in the Ratings charts/popup tables. [CHANGE] - Site has undergone a visual re-fresh to tidy up various screens and to make items more readable. Update: 14th September We've just made some updates to the Dashboard to drastically improve the performance of the dashboard and to remove old articles. We hope you enjoy using the newer faster version. Update: 5th September 2014 Some minor bug fixes. Update: 7th July 2012 We've made some new changes and fixes. - The “Starred” ratings is now added as a chart to the Popular page. Make sure you go through your shows and give them a star rating out of 5. See Release Notes and Help for more information. Update: 5th July We've just deployed the latest version of the Dashboard here. Massive thanks again to Tharshan our Developer for making all these changes. - When not logged in the Ratings links now prompts you to Log in. If you find any bugs/errors please use the Feedback form on the site. Update: 27th April We've just deployed the latest version of the Dashboard here. 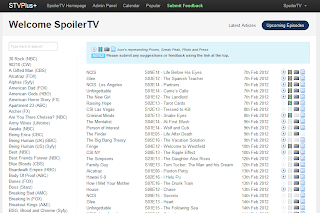 - You can now rate the shows you like with our 5 Star Ratings System. - Added new responsive design to provide better support for Mobile/Tablet and different Monitor/Screen Sizes. - Improved Article Pagination to load more articles. As some of you may or may not know we've been working on a great little feature that we hope you'll really enjoy and find useful. 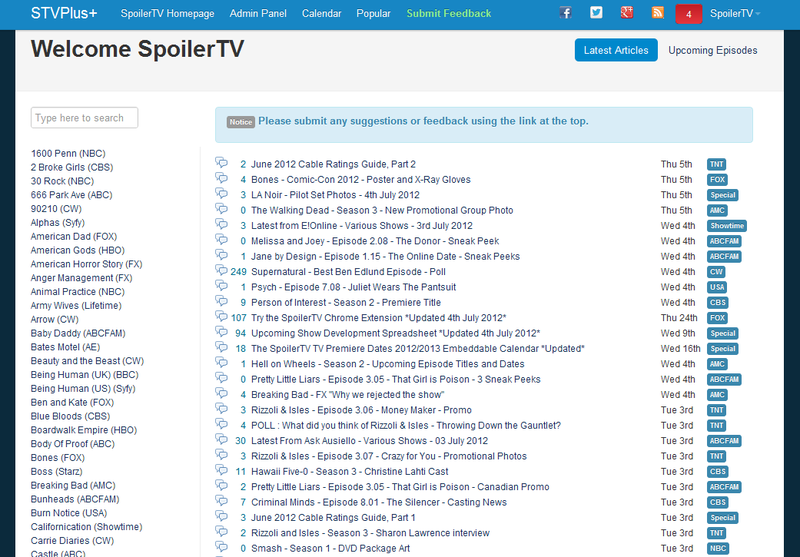 It's the SpoilerTV Plus Dashboard. Before we get into the details I would just like to say a few words of thanks to our lead Developer, Tharshan (http://twitter.com/viperfx09), who has done this all in his spare time and at zero cost. I owe him a massive debt of thanks as well as a large quantity of beer. I'd also like to thank Jason another developer who has just come on board to help with the future development of this. And lastly to all the Beta testers who have helped shape the product and as well as finding the bugs! 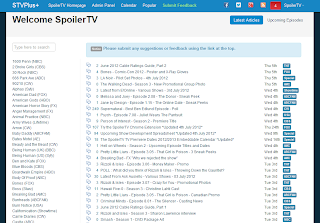 So what is SpoilerTV Plus Dashboard? - Customisable Show Favourites to display just the information you want. - The Episode Database will have future episodes titles for a large number of shows before any other site. - Quick access to Promotional Photos, Promos, Sneak Peeks and Press Releases. - Highly Configurable with more configuration options coming. We also have a dedicated Twitter Account for all STVPlus news and updates here. It is HIGHLY recommended that you follow this account to be kept up to date with any updates and downtimes etc. This is just the first release of the system and there are likely to be some issues. If you have any questions, suggestions, bugs etc please use the Feedback from here. Or in the comments below, or by emailing me directly. All the above links can be easily found on the STVPlus dashboard. As mentioned this is just the first of several releases we have planned for STVPlus and new releases will have new features and functionality. Some of the things we hope to include are: Support for Multiple Sneak Peeks, Ratings Statistics, Improved Calendar, Article Sorting, User Submission Forms, Email Alerts, Browser Notifications, Colour Themes, Mobile Support, as well as any ideas you come up with. This is all brought to you free of charge thanks to the awesome developers, helpers and the SpoilerTV team who help populate this data for you. So jump on in to http://www.stvplus.com and let us know what you think in the comments.